INSPIRATION: MOONFEST is inspired by the universal symbol of the moon as articulated in world culture (the visual and performing arts, religion, native rite, folk custom and science). We believe a cross-cultural, synchronized celebration of the moon will foster a worldwide spirit of cooperation, encourage international collaboration in space exploration and contribute to a greater awareness and appreciation of this great gift, our universe. Moon festivals aren't new. In China and elsewhere throughout Asia, the harvest moon has been celebrated for centuries with special poems, dances, songs and food. These festivals occur 15 days after the eighth lunar month. There have been moon festivals in Canada, Scotland and Finland. In the U.S. there are festivals now in California and twice yearly (Spring and Fall) in Colorado. 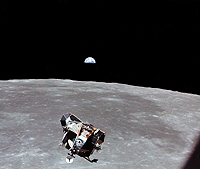 VISION: A simultaneous global celebration of the anniversary man's first lunar landing and walk on the moon's surface. STATEMENT OF PRINCIPLE: MOONFEST neither espouses nor embraces any sect, cult or worldview. It neither endorses nor promotes any political party or philosophy. It doesn't discriminate on the basis of age, gender, race, religion, creed or national origin. MOONFEST is a 501(c)(3) nonprofit organization incorporated in Louisiana in 2002. The seminal idea for MOONFEST was generated by playwright Shelley Herman Gillon in 1997 and nurtured by a group of women artists and arts activists then living in the Washington, DC, area. Chief among them were Carmen de Jesus Tiglao, Charlene Day and Alexandra Mattson. Each of MOONFEST's six boardmembers has an arts background in addition to her other field of study: Janet MacDonell, Esq. ; Faun Fenderson, Esq. ; Pamela N. Fritch, MA; Elizabeth Bramlet, MA; Maggie Arnold Silberstein, MA, MSW, and Shelley Herman Gillon, JD. In 2003 MOONFEST inspired creation of a children's musical and seeded the performance of a moon-themed ballet. Maryland playwright and visual artist Candy Drew created an award-winning children's musical tied to the 35th anniversary of the first lunar walk. In August, the Bayanihan National Folk Dance Company of the Philippines presented a ballet called "Pagdiwata," or "Thirteenth Moon." The choreography, by Lucretia Reyes Urtula, was taught to the company by Carmen de Jesus Tiglao, a ballet consultant, choreographer and founder of the Baile Foundation of the Philippines. Ms. Tiglao is one of the original supporters of the MOONFEST concept. For more about the performance, see the DANCE page. We are grateful to many individuals for their time, energy and effort on behalf of MOONFEST. The ACKNOWLEDGEMENTS section pays tribute to them. taken during the Apollo 11 mission. The launch of Apollo 11 occurred on July 16, 1969. Neil Armstrong took the first steps on the moon's surface on July 20. Some believe his "one small step for man, one giant leap for mankind" marked the most significant event of the 20th century. Buzz Aldrin drove the Lunar Module, and Michael Collins piloted the Command Module, the Columbia. Splashdown occurred in the Pacific Ocean on July 24. Seventeen Apollo missions took place from 1967 to 1972. Six involved manned lunar landings. On January 27, 1967, the first manned Apollo mission ended with a launchpad fire and the tragic deaths of astronauts Roger Chaffee, Gus Grissom and Ed White. In 1968, Apollo 8 was the first successful manned lunar orbit. Crew members William Anders, Frank Borman and James Lovell Jr. were the first humans to see the far side of the moon and bring back pictures of Earth from our moon. Apollo 17 made the last manned lunar landing in 1972 with astronauts Eugene Cernan, Ronald Evans and Harrison Schmitt.